The weather is chilly these days, and our attention turn from courgettes and tomatoes to foods that are less glamorous, ugly even, but no less delicious. At the markets I always stop at a particular stall that sells mainly root vegetables. Sweet red onions to caramelise and be plopped onto grilled meat dinners. Parsnips for roasting- oddly enough the seller had to explain to her French customer how to eat parsnips, me, I am an old England hand and can roast them in my sleep. She also sells brussels sprouts, these we love too because I blanch them quickly and roast them with lardons to make a wicked side dish. Another staple is sweet potatoes, purple of skin with orange flesh within. 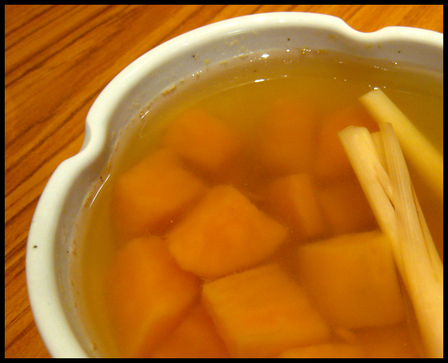 Delicious roasted but husband loves it when I make a tong-sui (sweet soup) of them. I cut them up, along with some candied and fresh ginger and a bunch of bruised lemongrass. Top up with water and bring to the boil, simmer until the potatoes are tender, about 20 minutes and voila, dessert is ready. Add sugar if necessary, sometimes I omit this step because I usually use a lot of candied ginger but titrate accordingly. 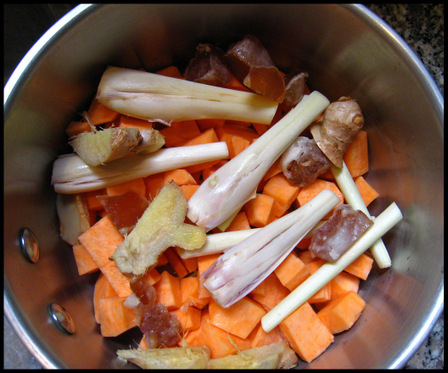 Ginger is good for stiff joints and muscle aches while lemongrass soothes itchy throats, so this soup comes in very handy to ward off all these little ailments that creep up on us when the mercury drops.